Given her first crayons at three, Nancy Congress Bass drew a picture of a pink poodle. She loved the slew of cats housed down the street and would grow up to be an artist with a penchant for painting animals of all species—roosters, pigs, birds, bears and sheep. Her favorite would be the cow. 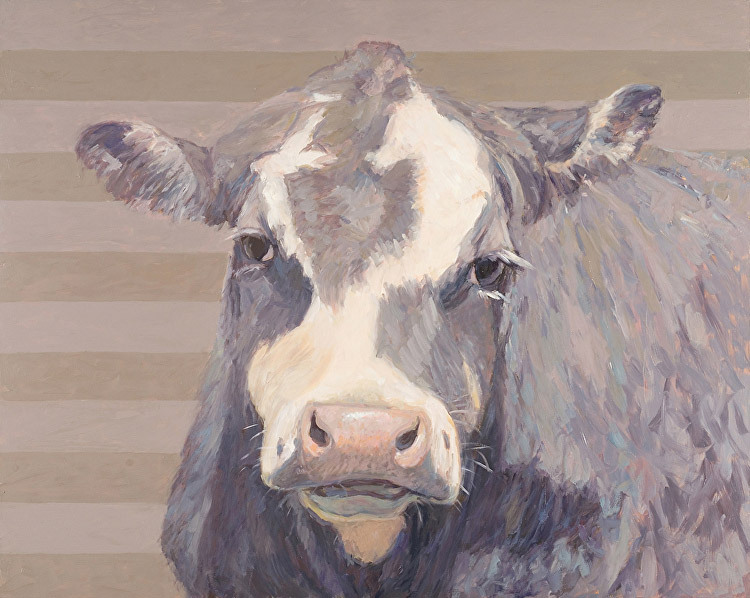 In 35 years as a professional artist, Bass estimates she’s probably painted hundreds of cows and is still counting. 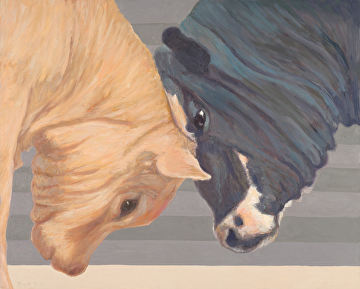 “We live in harried times…cows take us back to when life wasn’t beating so fast. Cows are very calm, especially if you move to them slowly. They seem the epitome of pastoral life; they have a quality of peace and wisdom,” says Bass. A native of Peoria, Illinois, Bass and her husband, Dave, moved to a farm near Charlottesville, Va. in 1983. Earlier they owned and ran a chain of pizza restaurants. Dave, a skier, and hiker of the Appalachian Trail, loved the land, and he and Nancy decided to raise cattle on their farm. 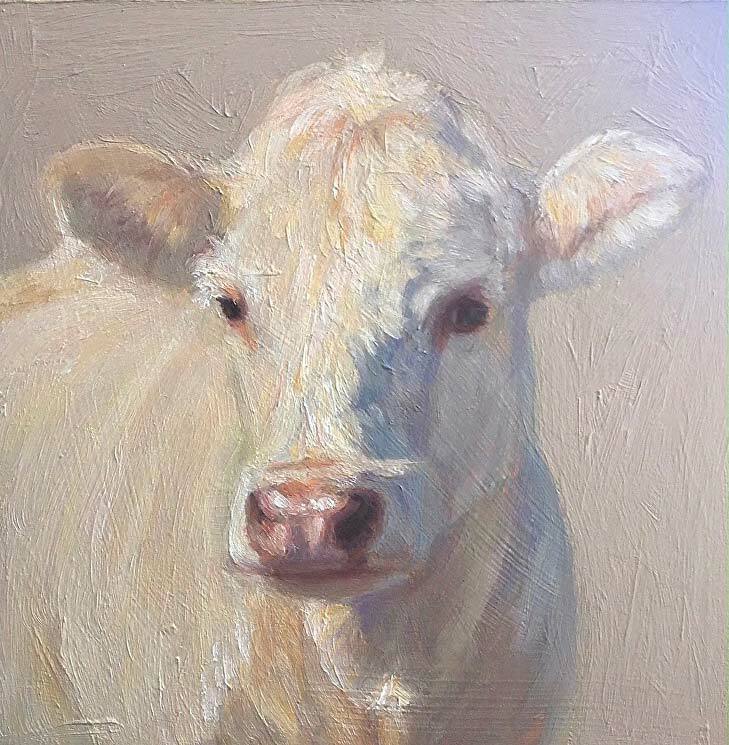 “We raised our herd of Simmental, Hereford, Angus, and Charolais cows who ate the grass and served as beautiful models for my paintings. 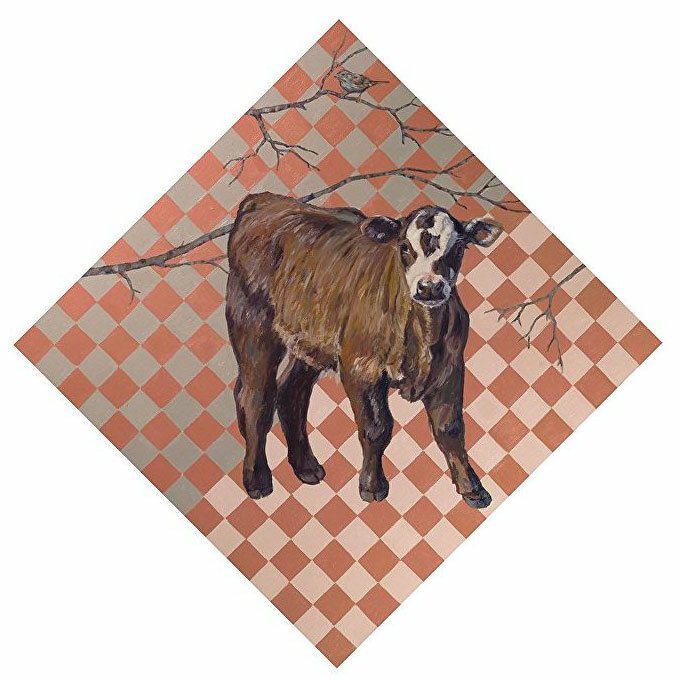 Bass continues to paint her herd and other animals, spending her winters in Boca Grand, Florida and summers in a cabin near Asheville, North Carolina with its mountain views and wild animals. Bass’s artistic talent was spotted early by her parents and teachers. Her father, a jeweler, she terms a frustrated painter who loved to design; his passion was art. He took his daughter with him to visit the Art Institute in Chicago. “In kindergarten, I only wanted to stay at the art table. Later, I took art classes before school and both parents encouraged me. I had this inspiring experience at an early age. I did art any way I could,” she says. Bass attended Drake College in Des Moines, Iowa and majored in art and entrepreneurial studies. 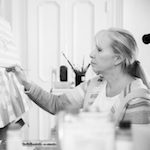 “I was told I couldn’t make a living being an artist.” Her entrepreneurial skills soon surfaced when she left college early to marry and start a business. 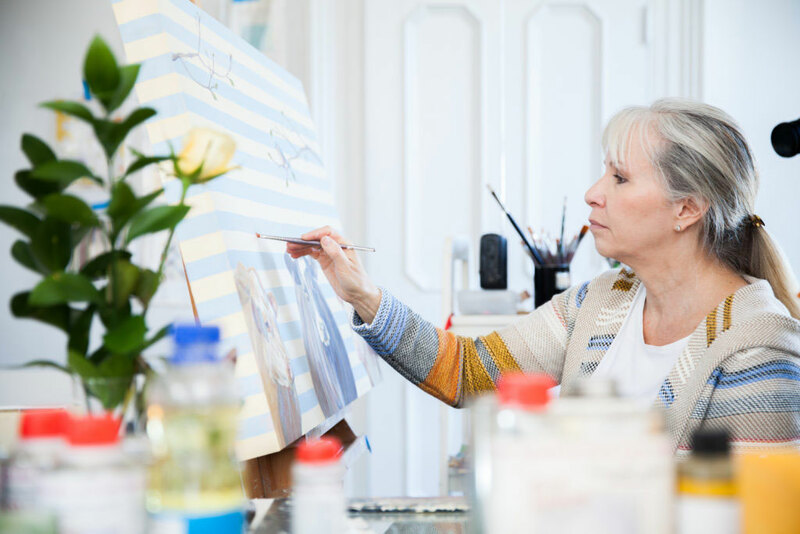 While working day and night, Nancy continued to draw, take workshops and hone her painting skills. 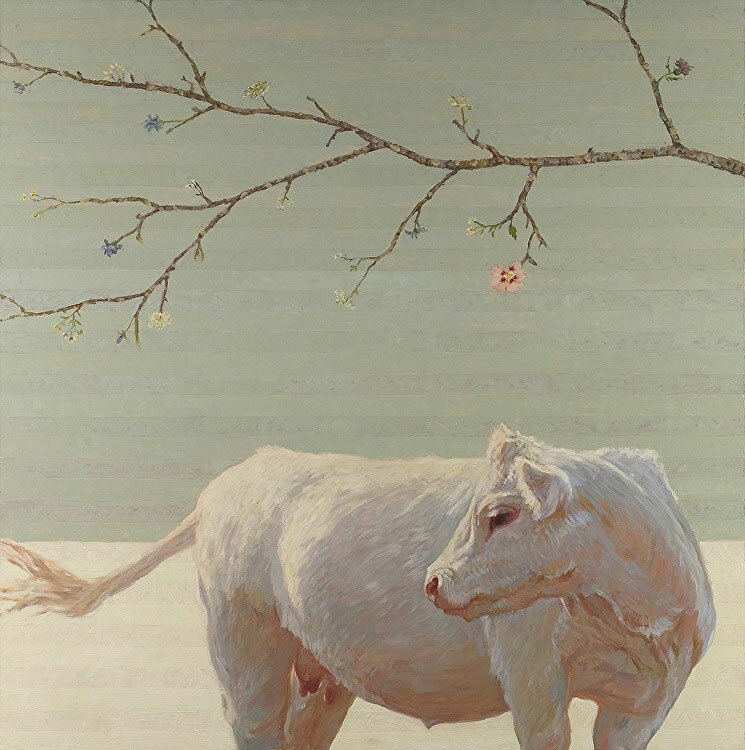 Drawn to realistic and abstract art, Bass admires the masters Botticelli, Degas and Vuillard along with Hopper, realists Wayne Thiebaud and Janet Fish, as well as color field painters Mark Rothko and Richard Diebenkorn. Bass began her career creating pastel portraits of children. 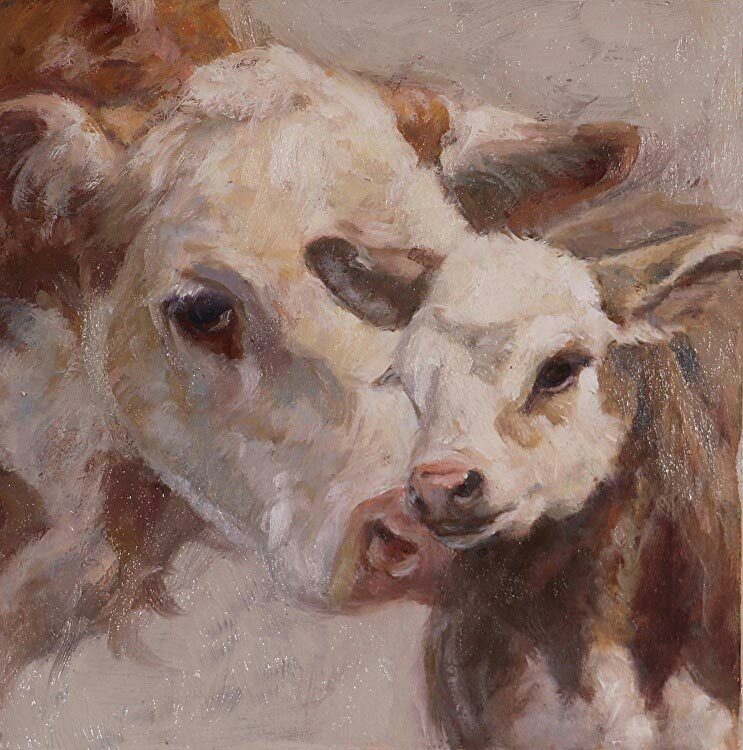 She taught herself landscape painting but her preference for portraiture reemerged in painting cows, each with its own distinct character and disposition. Each has its own charisma and a pet name, among them, Annie, Angel, Ferdinand, Rusty, Little Bell and Snow White. 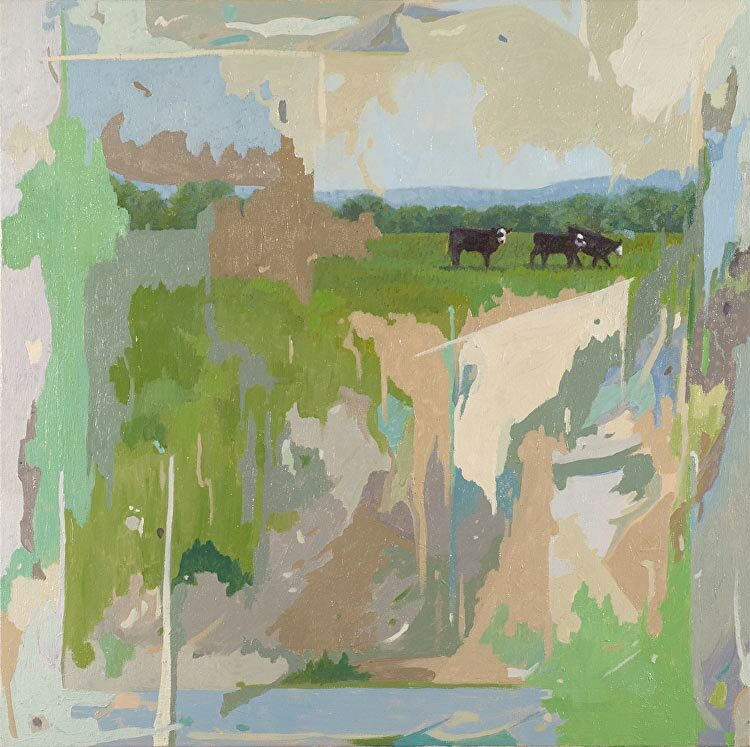 To avoid sentimentalizing her subjects, Bass “likes to mix it up,” and paint her cows in a variety of techniques, sizes, settings and backdrops. 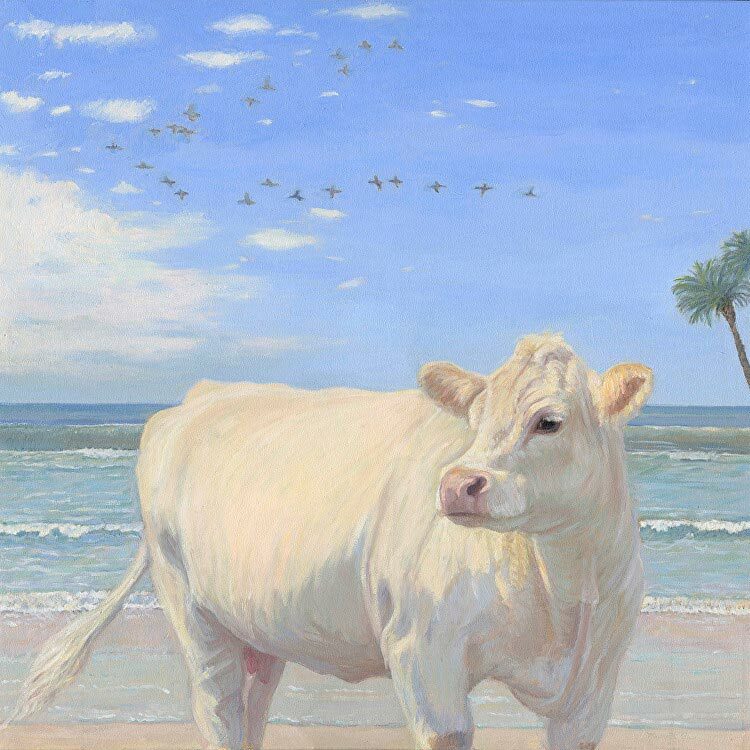 They are depicted in smooth stroke close-ups, grazing in wide fields, confronting the viewer beneath tree limbs, or most amusingly, facing forward against gentle waves at the beach. 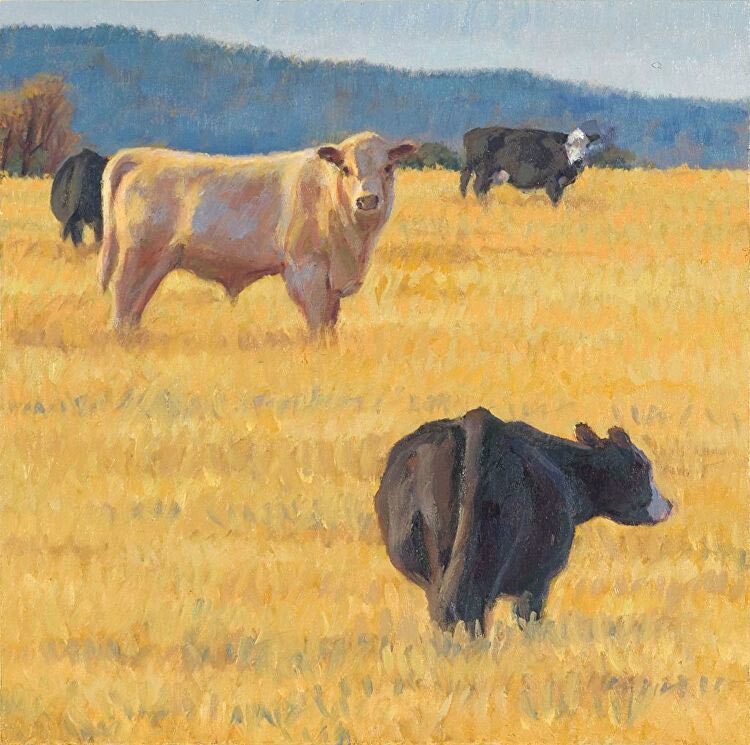 A background of textures—subtle stripes or squares—“highlight” the cows. 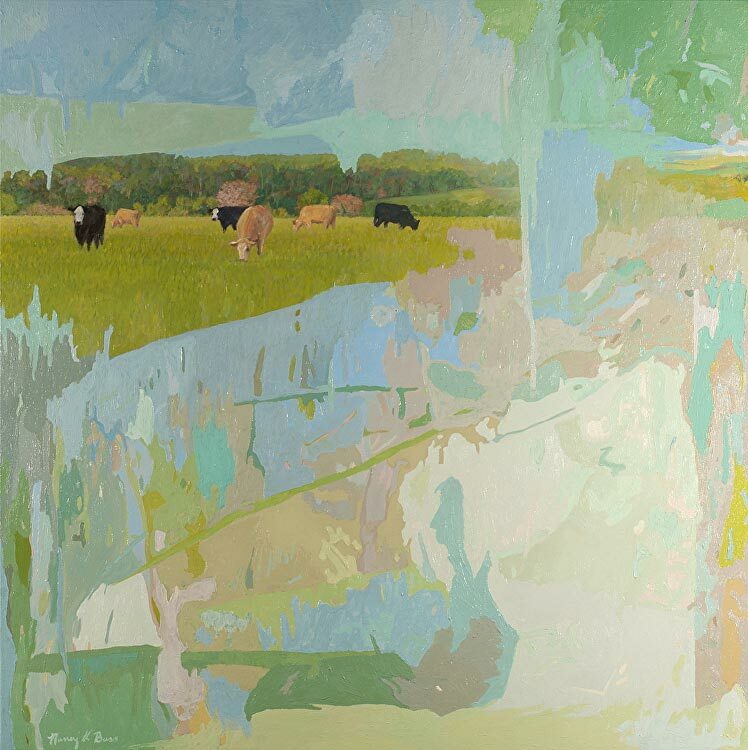 Studies combining naturalistic cows against patches of colors, reflect the “change and break up of the land,” the development and growth issues which Bass witnessed during years of farming. 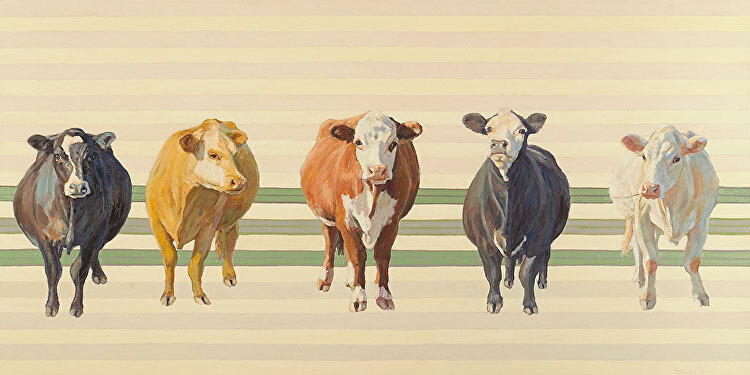 Bass relies on her file of digital photos as a rich resource of different cows and breeds. “I move the cows around and play with the settings. I was told early it’s good to go back and forth in size and style…mix it up,” she repeats. “The goal is to make a beautiful painting; a moment of peace and beauty. 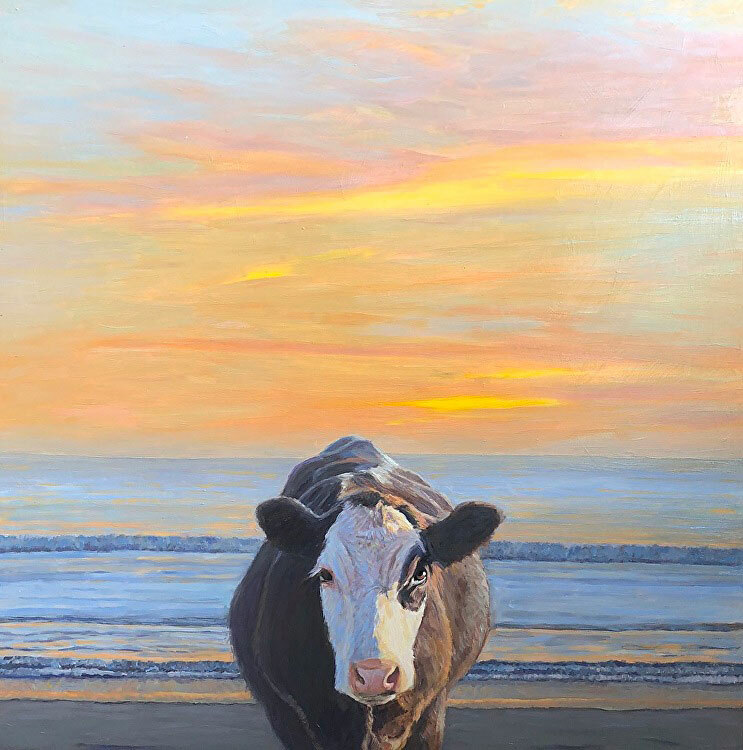 In early fall, Nancy Bass packed her paints and palette, off to Maine to paint its craggy landscape and, if lucky, in Rockport to paint the well known herd of belted Galloway cows. 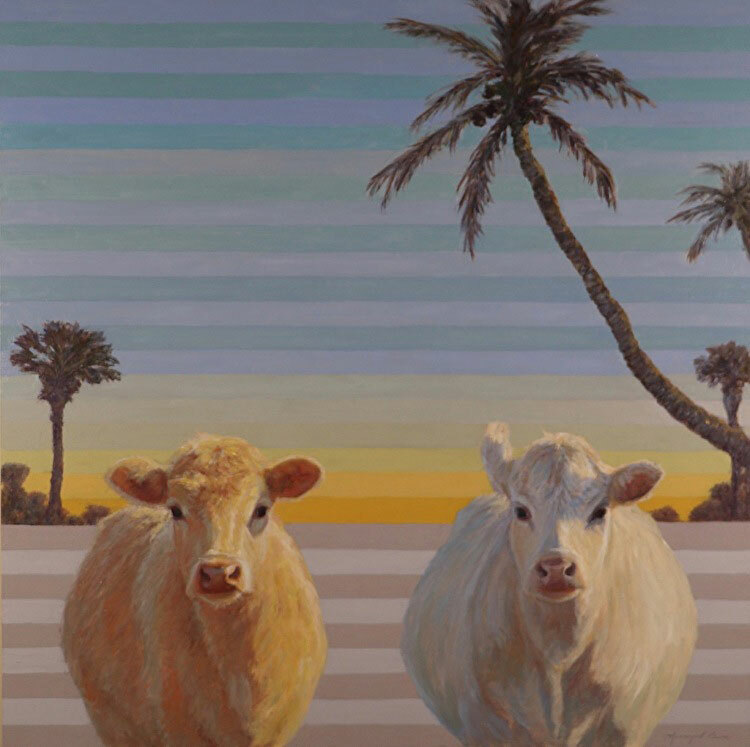 Bass’s charming work has been shown in galleries from Dallas, Texas to Park City, Utah and Fisher’s Island, New York. 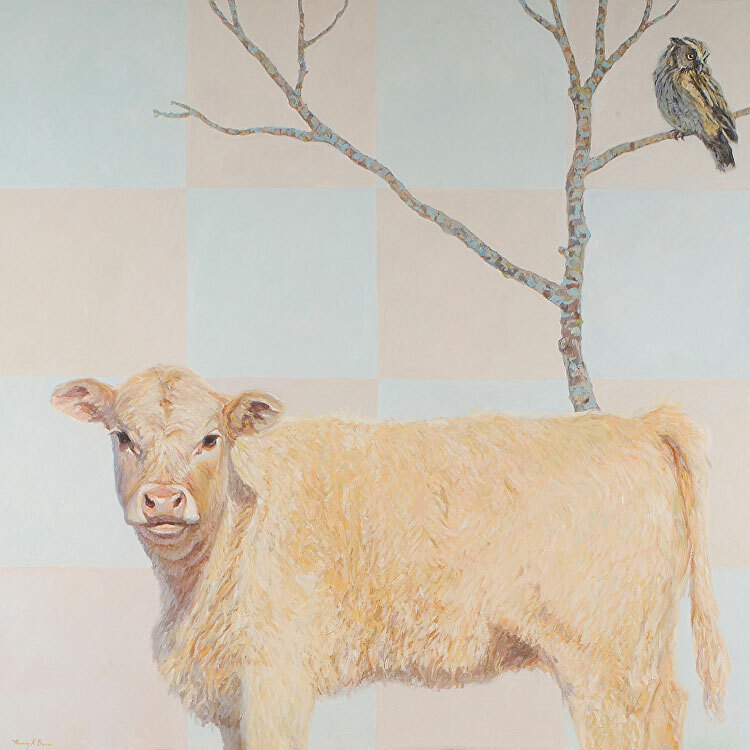 She has often shown at the McGuffey Arts Center in Charlottesville where she was a resident member for five years. Visit nancybassartist.com to see more of Bass’s paintings.